FEEDGRAIN values have nominally eased about $5 per tonne in the past week, with subdued demand for barley tied to the possibility of limited buying from China, and boat wheat arriving from Western Australia, helping to soften the market. 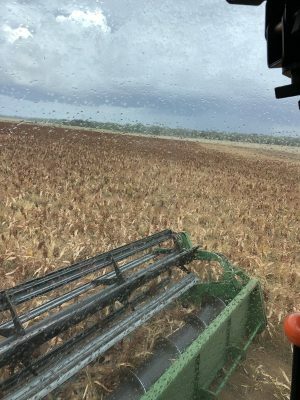 Minimising price falls has been the reluctance of southern Queensland growers to forward sell sorghum. “Until they get on to the paddock and see whether they’ve got sorghum grade 1, 2 or 3, they’re just not selling anything,” Horizon Commodities trader Aaron Jones said. “Growers also are far more likely to store some grain now than a month ago. Sorghum today is bid at around $345/t delivered Darling Downs during the harvest period which has now started and will end in April or May, and compares with bids in the $350s a week ago. Nearby barley earlier this week was quoted around $390/t delivered Downs and wheat $430/t, and traders have seen values under further pressure as the week progressed. Mr Jones said price spreads were changing so much that it was hard for consumers to lock in forward prices with confidence. “The sorghum users, such as piggeries, mills and some of the feedlots had been finding sorghum attractive, but sorghum’s under pressure, mostly because barley has become cheaper. “A month ago most were all using wheat, then for a while they looked like switching to sorghum. and now they are going to either barley or barley/sorghum. February pick-up Brisbane port barley has been trading around $370/t and wheat around $410/t. Both were available for purchase over a spread pick-up period, and had been trading with an incremental monthly premium of $2.50-$3/t. The Darling and Western Downs, had some light rain yesterday, but not enough to generate quality concerns or delay harvest significantly. Grain input values to the feed sector into Australia’s most actively traded feedgrains market region, the Darling Downs, have fallen by $15-$20/t over the last half January and into the first week of February, according to Agracom trader Brett Donoghue. While all prices have eased a little, what has moved a lot is the relative value of each of the three main feed grains barley, sorghum and wheat. “Remembering that drought prices pushed barley and wheat prices to parity for about six months in 2018, the news of the China anti-dumping investigation late last year triggered a decline in the relative value of barley by at least $50 a tonne,” Mr Donoghue said. “Today we are seeing more anecdotal and hard evidence the cattle-on-feed sector is starting to switch back into barley again. “We expect barley will come back into the ration now at the expense of sorghum, and wheat will stay in. Mr Donoghue said for price relativity and continuity of supply, people know that wheat shipments can continue to come in from Western Australia. “That security of input through 2019 explains why poultry feed buyers and cattle feedlots are happy to keep wheat in their ration. “Poultry will begin to see a heavier sorghum inclusion while feedlots will move more towards a barley/wheat ration. Mr Donoghue said end-users had adjusted to price levels of at least $400/t, and have decided not to panic about supply. “At the end of the day the grain is flowing, and the bulk exporters out of WA are doing the job of satisfying the demand through the east coast ports. Storm rain in recent days in the southern half of NSW has had no effect on its cash market, with most of its mixed farmers happy to hold grain they have on farm in case they need it to feed their sheep and cattle in coming months. Agfarm consultant Matt Noonan, Wagga Wagga, said most of the activity taking place in the market was trade based. “It’s been quite slow, and not a lot of grower tonnes are coming to the table,” Mr Noonan said. “Anyone with livestock is waiting to how the rest of summer goes, and how autumn looks, because they might need it then. Mr Noonan said grazier demand for grain was starting to reappear in places, with nutrition for ewes now being joined a priority. Mr Noonan said he thought most grain delivered to bulk handlers in southern NSW had been sold already. Southern NSW end-users are putting some sorghum straight off the header in northern NSW into their rations, and wheat has been trading in reasonable volume at a premium of around $30-$40/t to barley. “Barley seems to be the grain that is mostly being held on farm most, and the trigger for a lot of growers might be that $400/t ex farm mark. Wheat bids into the Griffith region are sitting at around $430-$435/t for prompt delivery, and offers are closer to $435-$440/t. Small parcels of barley have traded lately at around $400-$410/t ex farm for close-by consumers, but the market is bidding at closer to $390/t on commercial tonnages. In cottonseed, trading has been mostly limited to current-crop spot coverage. “Cottonseed is still strong on grazier demand, and some short covering at $700-$710/t delivered prompt Darling Downs,” Woodside Commodities manager Hamish Steele Park said. Today’s ex gin new-crop market is quoted around $445/t for southern NSW, $450/t for the Macquarie Valley for gin spread 2019, and $500/t plus Darling Downs.